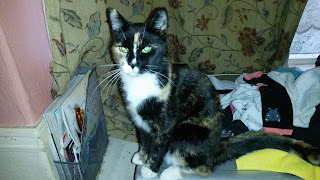 I finally managed to take a decent photo of the little 'un Mindy. She is usually a blur of movement or unable to sit still long enough to enable me to capture a reasonable image. This week so far has not gone well with the cooker conking out and now I am full of yet another cold. Less than four weeks to Xmas and the cooker gave up the ghost. We've had it many years and it was a cheap replacement which has been repaired twice before. Today a new replacement cooker installed and the old one removed. I decided to buy the new one from a local small but reputable retailer. I take the view that although costing slightly more than buying from one of the big chain stores or the frequently advertised Ay Oh, I prefer to keep a local company going. Too many small local stores go out of business and not just to the big chains but also the internet. I am as guilty as the next person for using the internet to shop but occasionally I opt for shopping locally. As for the latest bloody cold...paracetamol and wrapping up warm plus as of now (19.20) Jack Daniel's Rye might help to batter it into submission. I am not a great fan of JD but I do like Rye Whiskey and I hadn't had this one before. Plus the reduced price for Xmas made the purchase that much easier! 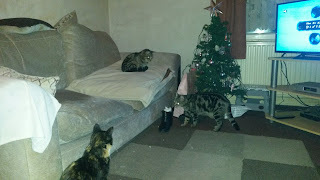 The small Xmas tree is up as we have learned a hard lesson where cats and trees are concerned from past Xmases. 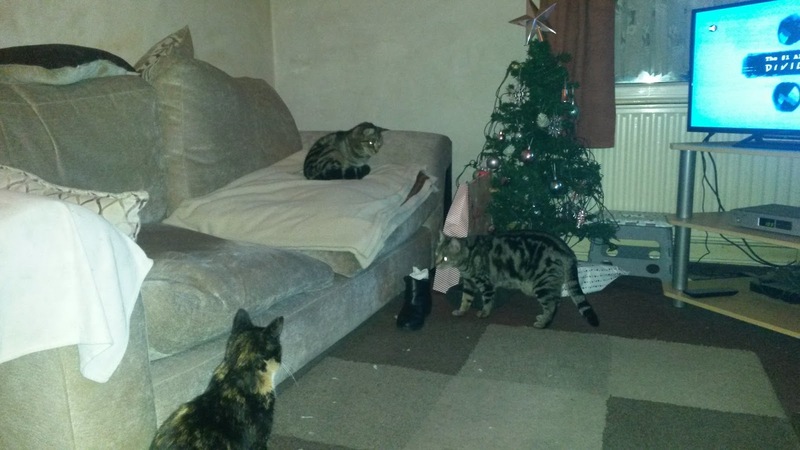 Sherlock has attacked it several times whilst the others have removed the occasional bauble. We turn the lights off when we are out, not just because of the fire risks but we found Sherlock chewing the wiring so it's best one of us is present when it is lit up. Mog used to climb it and knock it over every time. At least with a small tree it won't take long to reassemble. Now for a drop of that whiskey and a good book. O, so you're a Joo?